Kenya’s President Uhuru Kenyatta has been re-elected following Tuesday’s vote, the national electoral commission announced Friday evening. 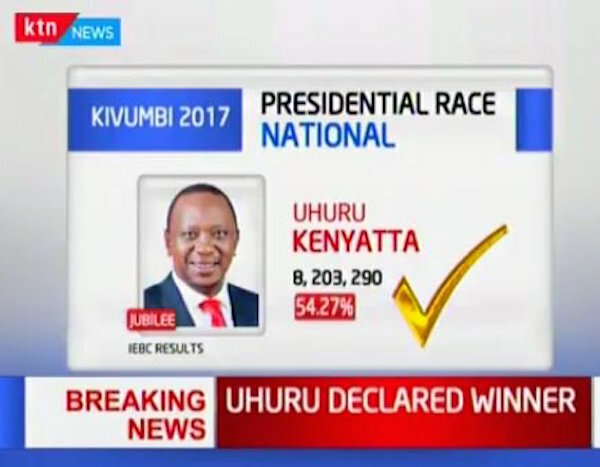 Mr. Kenyatta took 54.27% of votes, ahead of his rival Raila Odinga, with 44.7%. But the opposition coalition rejected the commission’s announcement before the results were declared, calling the process a “charade”. Hundreds of police in anti-riot gear are in the streets of the capital, Nairobi, amid fears of further protests by supporters of opposition candidate Raila Odinga who claims the vote was rigged.